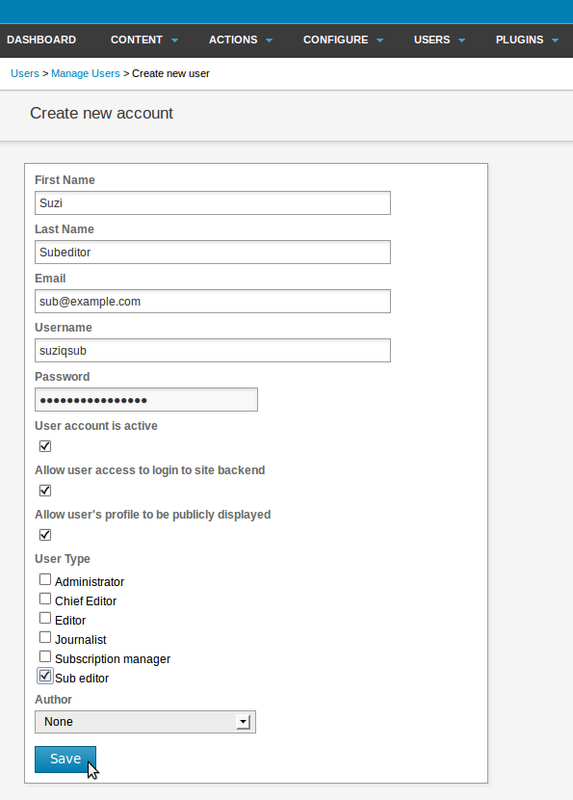 Newscoop's user management features enable you to control access for both staff users and readers. 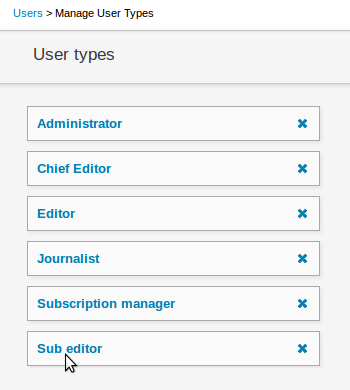 You can define User Types, such as Journalist or Editor, and manage author profiles independently. User management tasks have their own sub-menu, Users, on the main Newscoop navigation menu. Initially, Newscoop has only one user account: admin. Do not delete this account, as it is needed to inform users of events on the Newscoop system. The email address associated with the admin account is used as the "Reply-To" address in these notification emails. Instead of configuring each access right for individual users, which would be very time-consuming for a large publication, Newscoop enables you to create generic user types which can be assigned to multiple users. A User Type is defined by a checklist of tasks that the user is allowed to perform in the Newscoop system. This list of tasks ranges from creating, managing and editing publications, sections, or articles, to theme and plugin management. 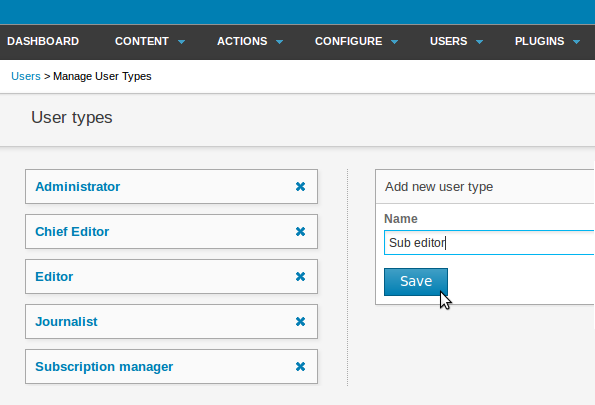 To create a new user type, click Manage User Types on the Users menu. On the right side of this page, enter a Name for the new user type in the Add new user type box. Then click the Save button. When you return to the User types list, your new user type should be shown there. Click on its name to edit the permissions for that type. Check the boxes for the rights that you want enabled for this user type. For example, under System / Notification, check get for these users to receive notification emails from the Newscoop system, or moderate-comment for these users to receive comment moderation notifications. A sub editor User Type would also need to have the edit box checked under Authoring / Articles. Then click the Save button at the top of the list. To add a new user to the system from the administration interface, click Manage Users on the Users menu, and then click the Create new account button. You should specify the details of the new user including a username and password, whether the account is active, if the user should have access to the Newscoop backend (the administration interface), and if the user should have a public profile. Then choose a User Type (either one of the default types, or a custom user type that you have created). If the user account is to be linked to one of your publication's contributors, choose the Author name from the drop-down menu. (See the chapter Managing authors for details). Then click the Save button. 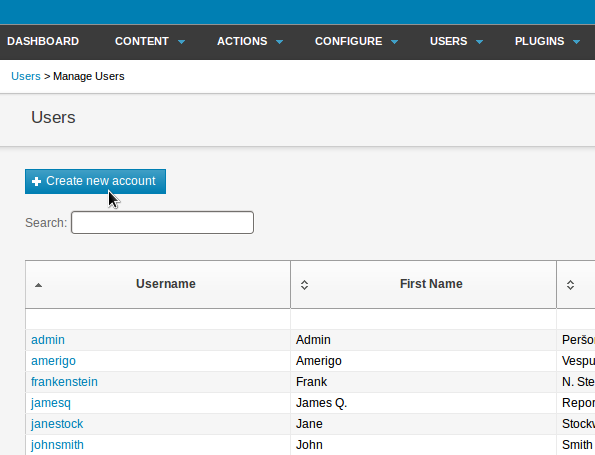 User accounts can be modified by clicking on the name of the user on the Manage Users page. 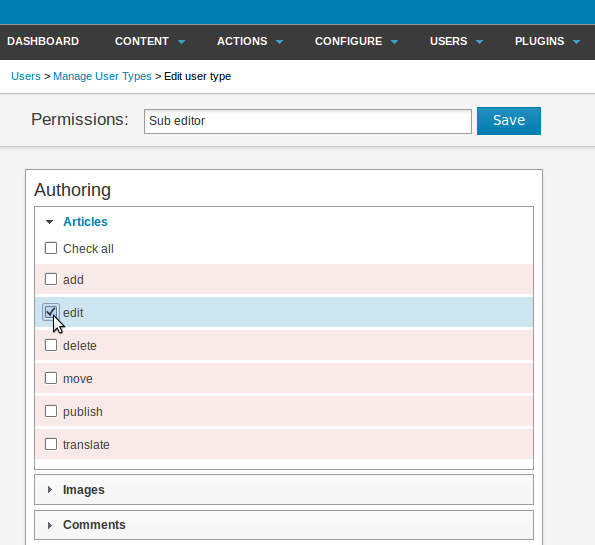 If you would like to fine-tune the rights assigned to a user, click the Edit permissions button on the Edit user page. To add or edit a password-based or IP address-based subscription, click the Edit subscriptions button, which will open a pop-up window. If the box Allow user's profile to be publicly displayed is checked, and the Save button clicked, the Edit profile button will become visible. Click this button to open a pop-up window in which you can add a picture of the user and biographical details.